Kirk Claymore is the director and founder of MAD Agency. 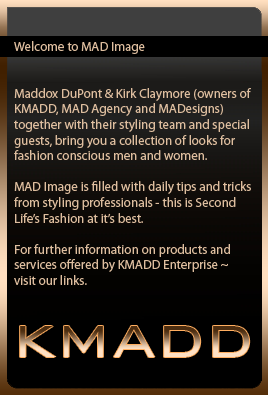 Man best known for marketing success behind MADesigns and KMADD City, Kirk also works as a stylist and marketing manager for KMADD. Mr. Claymore manages client liaison, show production and at times works as artistic director for MAD Agency. Maddox DuPont is the main content creator of KMADD brand. Maddox lends his creative expertise ensuring success of each MAD Agency show. Maddox works as stylist, set designer and is responsible for music score for each show. To see his work visit MAD Agency Fashion Sets. Jax Aster is experienced model and works as a director of MAD Agency. Jax Aster is leading MAD Image blogger, KMADD Fashion District manager and brings his style expertise to each of the show. Jax works as manager of both clients and models for MAD Agency, ensuring each show is running smoothly. If you have inquiries about modeling or the MAD Agency runway events past, present or future, please IM Jax Aster.